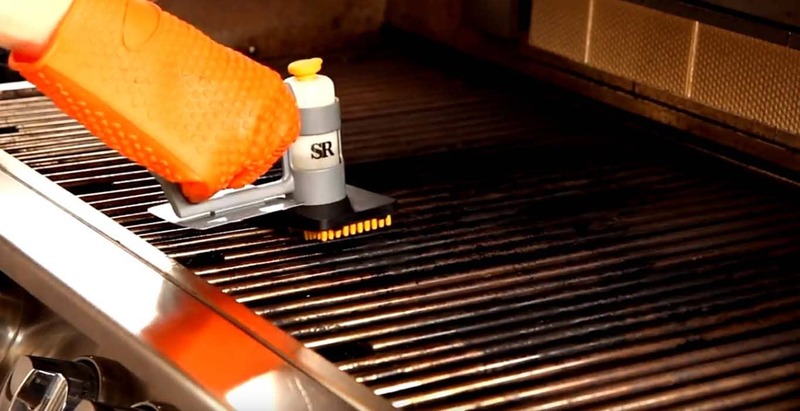 Extending the life of your grill is as easy as cleaning it regularly. While a deep clean isn’t necessary after each use, there are no benefits to having a dirty grill. Despite the myth that not cleaning your grill adds flavor, the leftover fat, salt and sauces will cause metal parts to break down and need replacement. You will inadvertently create a fire hazard if you neglect to clean your grill regularly. Not to mention, if mold grows in your grill, it could become a health hazard and it will take time consuming extra steps to clean it out when you could have just cleaned the grill after a cook. Be sure to check the grill’s manual to see if there are any special cleaning instructions before you begin cleaning. The manual may provide you with specific instructions on how to properly remove grill parts and a timetable for grill maintenance. When taking a grill apart to clean, make sure to close and disconnect gas lines. Cooking grates should be cleaned at end of every cook. This will keep mold, carbon build up, and grease off of the cooking surface and, more importantly, off of your food. On a gas grill, this means you should turn the grill burners to high at the end of every cook to burn off any excess food or grime left on the grates. If you have a charcoal grill, burn charcoal with the grill’s lid closed. Allow the flames to burn until all leftover residue has turned to ash. Let the grill heat up for 15-20 minutes. As the grill heats, any remaining food will turn into ash and leftover grease will be burned off. After the leftover grime has turned to ash, use a grill brush to scrub until all particles are removed and the grates are clean. Once you’ve scrubbed the grates, apply a light coat of oil to the grates with a cloth or brush. Make sure the oil has a high smoke point, like grape seed oil. This will protect your grates from corrosion and prevent food from sticking. We recommend lightly oiling your grates after each cook. Make sure to clean any leftover ash or leftover charcoal after you’re finished cleaning the grates. Dump the leftover ash into a metal or non-combustible bucket. Do not use plastic or combustible material because if the ash hasn’t fully cooled, it could melt the bucket or cause a fire. After checking to make sure everything has finished burning and has completely cooled, you can dispose accordingly. Every 3-4 cooks, you will need to break the grill down and clean the inside of your grill. After you have burned all the excess off your grill grates like you do after every cook, wait until your gas grill has completely cooled down and you’re now able to clean the inside. Remove the grates, flame tamers such as ceramic trays, and any burner coverings. Clean these pieces with a grill brush. Make sure to inspect the burners for cracks. Also make sure that all tubes are debris free. If the burners haven’t been used in a while, be mindful that if spiders have gotten inside of your grill and webbed up the manifold it could cause gas flow issues. If a port is clogged, you can use a toothpick to clear the obstruction. Remove the charcoal tray and empty any remaining charcoal that may be left over from your last cook. Scoop out the remaining ash with an ash tool. Use a wire grill brush to push any remaining ash residue into the ash catcher. Remove the ash catcher and dump it out. Use warm soapy water to clean the inside of the grill, along with any pieces you have removed (ash catcher, charcoal tray, etc.). You can prevent build-up on the underside of the hood (caused by carbon, soot, and other by-products) by cleaning it regularly. If neglected, these scaly flakes can break off during a cook and ruin your food. To clean, put on a pair of grill gloves and use a wire grill brush to scrub. Do not use chemicals like oven cleaners. Instead, you should opt for products like Carbon-Off to easily remove the build-up. Use a shop vac or the grill’s ash pan to remove all debris once you’re finished. Keeping your temperature probe on the back side of the hood thermometer clean is important. Carbon can render the built-in gauge useless, especially in a pellet grill or smoker. Use Carbon-Off and a soft cloth or sponge. You can also use a hard bristle tooth brush to scrub around the probe. If you ever open your grill and find mold, don’t panic and take it to the curb. Your grill can recover from mold if you clean it properly! Mold is caused by the presence of moisture inside the grill combined with grease. Don’t use cleaners or brushes to remove active mold because you can inhale spores, which can cause illness. Instead, use heat to kill the mold. Discard anything that could retain mold. If you’re using a charcoal grill, make sure to remove any charcoal that may still be inside the grill from your previous cooks. If you’re using a gas grill, turn all burners to high. If you’re using charcoal, burn a chimney starter of charcoal with the grill’s lid closed. Close the lid and let it burn for at least 20 minutes. Once the grill cools down, and the mold has been burned, use a wire brush to clean everything in the grill. Remove the inside parts of the grill and scrub with soap and water. After cleaning, put everything back in the grill and turn the burners on for 20 more minutes on high to burn off any remaining mold, debris, water, or residue. Maintaining your grill’s appearance is simple. Remove dust, dirt, and grime from the exterior of your grill by wiping it down with a damp cloth. Then use Magic Stainless Steel Cleaner to keep the stainless shiny and create a protective coating that repels dirt, water, and fingerprints. Never use an abrasive brush. Polish the exterior with grill cleaner. 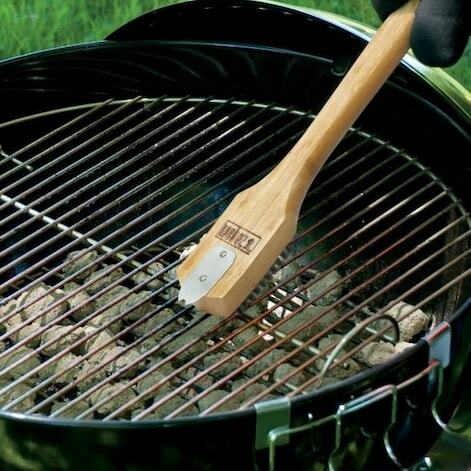 If you accidentally scratch your grill, use Scratch-B-Gone.